Veteran rap duo Concrete Mob first surfaced in the underground scene in 1996 with their hit demo "Boiling Point". 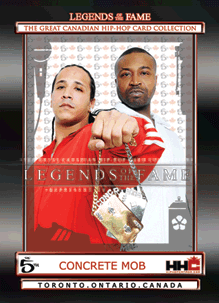 Since garnering local fame, emcees Black Jak and Deuce Deuce have toured all over central Canada and parts of the US, achieving international recognition and selling over 15,000 records independently. The hustle never ends for this pioneering rap duo, who gave the streets a re-up Mob-style in 2011 with the release of Deuce Deuce's Reality Check.